Kachana Station relies on animals to fertilize the ground with dung and urine, and to provide ground cover by trampling down the vegetation that isn't consumed. Due to our 'high density-low duration' management and grazing method the animals are in a certain area for only a small amount of time giving the vegetation time to regrow before the next grazing cycle (this can be anywhere from 3 to 12 months or more depending on the environment, the season and what it is that we are wishing to achieve). By managing our land in this way we have seen improvements in soil health, vegetation health and the return of permanent water sources (that had been seasonal before we started management). This is due to improved water-capture and retention. We call this “Rainfallmanagement”. Each wet-season we store a little more water a little longer in our soils. As life in our soils increases so does vegetation; run-off is reduced and less moisture is lost through evaporation off the soil-surface. 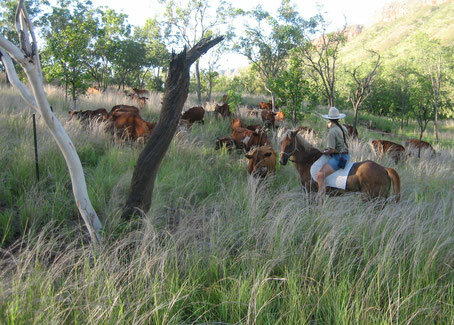 Where we are able to manage the land with animals, we do our best to keep fire out. 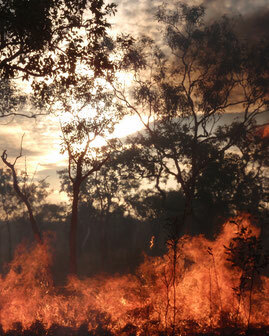 By removing ground-cover, fire contributes to dehydration of the soil. This causes more water run-off during the wet season leading to loss of soil and erosion. Lack of ground cover generates more heat in the ground, drying out the soil and killing any new plants trying to grow. Fire destroys the habitats of smaller animals, all of which are an important part of our eco-system. In areas where we are as yet unable to manage with cattle (due to lack of animal numbers and team members) we use fire to create firebreaks and to minimize the impact of wild-fire.